Robin Lawton, Head of Classics commented, "It is unusual to have so many US cars entered in one sale and particularly to see so many 1960s and 1970s 'muscle' cars. The majority of the cars have come from private collections and all have been maintained to the highest standards." Arguably the most desirable car in the sale is the 1957 Thunderbird Convertible, complete with porthole hard-top. Estimated at around £40,000, this iconic T-Bird is finished in black with black trim and benefited from a complete nut and bolt restoration in 2003 before being purchased by the current owner and imported to the UK in 2006. This Thunderbird has been appraised as a '99 plus point car' and benefits from the retrofitting of a genuine Ford air conditioning system. Careful storage and minimal use has ensured that it remains in beautiful condition and it has covered just 65,000 warranted miles from new. refurbished to the original specification. The car has been with the same Charger enthusiast for more than 20 years and is now UK registered with a current MOT. Estimate is around £25,000. The sale also features a Dodge Charger R/T from the following year. This particular 1970 example is finished in bright metallic blue, offset by bright finished alloy wheels with the black interior highlighted by a set of white dial gauges. Under the hood lurks a detailed 'six packed' 440cu-in (7.2-litre) 'Magnum' V8 engine, with many additional high-performance parts. It is also expected to sell for around £25,000. The 1967 Plymouth Barracuda is the less common 'notchback' coupe version, much favoured for drag racing in that period. The car is fitted with the even rarer 383 cu-in (6.3-litre) 'Golden Commando' big block V8. Restored to a high standard with a Keith Black engine and bristling with goodies, the interior is trimmed in a contrasting off-white interior complete with floor shifter. The exterior is finished in black with a red and blue side flash, set off by a set of aluminium racing wheels. The estimate is around £15,000. The oldest 'Yank Tank' in the sale is the 1948 Cadillac Club Coupé, which boasts a sleek fastback design. The car on offer is finished in Ivory with brown interior trim and is in very original condition. The car resided in Germany for a number of years, where it was displayed in a museum. It is valued around £12,000. By contrast the 1993 Ford Mustang SVT Cobra is the most recent of the American cars in the sale. The only car of its type in the UK, it has covered just over 8,500 miles from new. In total, just 4,993 examples of this model were built and the vehicle offered for sale here is number 4879 according to the certificate from the Ford Motor Company SVT Division. Finished in metallic teal blue and totally original throughout, this car sits on 17-inch alloy wheels unique to this model and has all the listed options, which include sunroof, leather seats and CD player. Imported personally by the vendor three years ago, the car has been meticulously cared for and won the Master Class Concours at the Mustang Owners' Club Show last July. Estimate is around £12,000. The 1965 Corvair coupé is a rare car in the UK. Finished in white with matching leather trim, it was imported and maintained to the highest standards by Portcullis Motors Ltd. The car is largely original throughout, apart form the white leather seats which were replaced approximately eight years ago. This Corvair was acquired from a museum in Kansas and the recorded mileage of 40,250 is believed correct. Estimated around £4,000, this seems exceptionally good value. 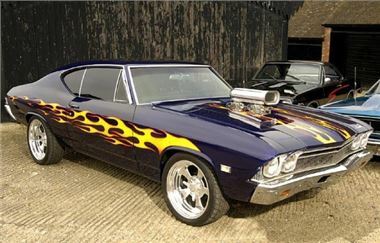 The 1968 Chevelle is a real head turner, a purple and blue metallic 'resto-mod' adorned with flame graphics and an aluminium induction ram protruding through an aperture in the hood. Power comes from a 'tricked out' 396 cu inch 'Big-Block' V8 sporting a host of performance and detail parts. The black interior is a little less brash, featuring high-back bucket seats, a three spoke wheel, T-handled floor shift and ancillary gauges. Built in the Kansas City plant, this vehicle is UK registered, having last been resident in Nebraska. Expect to pay around £21,000 to drive this home. The 1969 Dodge Super Bee on offer at Blackbushe is believed to be the lowest mileage and most original surviving example of this budget 'muscle' car. Finished in 'Citron Yella' with tan interior and matching vinyl roof, it is complete with its original 4-barrel 383 cubic inch V8 engine. A California-ordered car complete with factory air-conditioning, it has covered around 28,000 genuine miles from new and is complete with its original dealer order sheet, detailing all the specifications and options from new. Now UK registered with a current MOT certificate, it is estimated at £25,000. The Oldsmobile Cutlass 442 derives its name from the high performance 4-barrel carburettor, 4-speed transmission and dual exhaust options it offered. This '68 car has been verified as a 4-4-2 High-performance V8 Sports Coupe built in the Lancing Michigan plant and is fitted with automatic transmission and a 445 cubic inch motor. Repainted in Teal Blue metallic and trimmed with silver blue vinyl, it was purchased by the vendor in the USA and is now UK registered. Values for the 442 Series are rising and this car is expected to sell for around £14,000. Around fifty vehicles feature in the first 'Classics from BCA' sale at the Blackbushe auction centre on Tuesday 26th February. The sale starts at 12.00 Noon, with viewing on the morning of the sale from 9.30 am and on Monday 25th February from 10.30 am to 5.00 pm. Entrance is by catalogue only, priced at £18.00 (admits two). The Blackbushe auction centre is located on the A30 between Camberley and Basingstoke. Catalogue details with photos of most of the cars (just click on the entries in the list) are displayed on the new BCA site at www.bca-classics.co.uk, which also features a free classic valuation service, downloads and advice on buying classic cars.